If you like a huge wall of sound that will blow up your speakers and rattle your brains, I highly suggest this band! Once you listen to this impressive debut, you will understand why I say that. 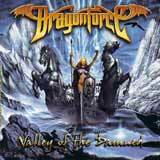 Dragonforce was originally named Dragonheart, but a band from Brazil had claimed the named Dragonheart first. Therefore, this band was forced to change its name. Personally, I wish they would have abandoned the whole Dragon oriented name altogether as it is quite overused I think. Anyway, on to the music itself. . .
Valley of the Damned is a killer marriage of furious speed, technical prowess, and melody. The dual guitar attack of Sam Totman and Herman Li provides a steady dose of speedy riffs and technically precise, over the top soloing and shredding to please the most demanding guitar fans out there. Didier (last name not given), the percussionist had two brutal, technical death metal albums under his belt at age 19 and lists his influences as Death, Morbid Angel, Metallica, and Slayer amongst others. Perhaps that explains the supersonic rhythms (almost overwhelming, but great!) and pounding double bass. There is just enough use of keyboards to accentuate the songs and add a majestic atmosphere without making the common mistake of saturating the sound. The outstanding guitars remain at the forefront of the sound where they should be. As per melodies and hooks, this album has no shortage!! Despite the speedy nature of the album, each songs is chalked full of catchy hooks with thick harmony vocals and uplifting melodies. The lead vocalist has an excellent range, able to hit and maintain the soaring high notes, maintaining a highly melodic delivery. Starfire is the only song during the album where the frantic pace lets up long enough for you to catch your breathe. It is a melodic ballad with some nice guitar work that hold its own against the other mighty songs on this disc. Simply put, the technically proficient guitar work, bombastic drumming, and enchanting melodies make this package more than just tempting. One drawback of this album the band must overcome in order to achieve greatness is the production. Is isn't bad enough to the point that the vocals sound raw, or the drums sound like pots and pans, but it isn't nearly as crisp and clear as I would expect and demand from a release of this nature. Considering the ultra speedy drumwork found on this album, the lackluster production blurs the drumwork at times instead of highlighting his talent as a fast and steady drummer. When working with this style of a percussionist, the quality of the production can make the difference between the drums sound like loud and fast noise, or a technical master. I'd like to see the band find a quality producer who can bring out the best in this band where their current producer has come up short. The wall of sound this band produces is certainly full and intense, so it is critical to make sure that all aspects of the sound sound tight and very crisp. The lead vocals could be turned up a bit in the mix, but this mixing issue is just a minor gripe when compared to the production job as a whole. Still, don't let the production steer you away from hearing these guys. The sheer musical talent and skillful songwriting certainly makes this album worth the purchase price. All in all, this is one hell of a debut album. Valley of The Damned is an intense and speedy helping of melodic metal that will not leave my CD player anytime soon. But please guys, find a producer that will bring out the best in your sound. As if listening to what our reviewer staff had to say a few years ago, Spinefarm Records recently reissued Valley Of The Damned and Sonic Firestorm — the first two full-lengths from Dragonforce (in Spring of 2010). Containing a host of songs that still rank among the most popular of their output including Black Fire, Evening Star and the title track itself, Valley Of The Damned has been remixed and remastered to allow every aspect of the recording to make maximum impact. Guitarist Herman Li noted that "fans who've heard the original mixes many times might find that the songs sound a bit different now,but that's how we always wanted the original songs to sound. We just didn't have the time back then to make everything the way we wanted." Previously unreleased studio track Where Dragons Rule has now been added to the audio side while the bonus DVD features never-before-seen live footage (Valley Of The Damned filmed in Japan), behind-the-scenes material, video commentaries, in-studio interviews and clips, all of it lovingly assembled by Li himself.